NEW DELHI, India (CNN) -- A police officer told an Indian court Friday that he saw the lone surviving suspect from last year's Mumbai terror attack shoot down another officer before he was overpowered, prosecutors said. 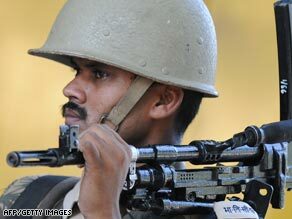 An Indian soldier on guard outside the trial of Mohammed Ajmal Kasab. Sub-inspector Bhaskar Kadam testified that Mohammed Ajmal Kasab shot at police officer Tukaram Omble, who had intercepted Kasab's car on the night the terror siege broke out in Mumbai, special public prosecutor Ujjwal Nikam told CNN. The driver of the car, Kasab's alleged accomplice Abu Ismail, was shot and killed by police, according to the prosecution. Omble pounced on Kasab as the young man fired his weapon, Kadam testified. The suspect was then overpowered by other police officers and taken into custody, the court heard. Kasab, a Pakistani national, faces 86 charges including waging war against India, murder and attempted murder. He has pleaded not guilty to all the charges, and recanted a confession to the crimes that he said was made under duress. The young man was caught on surveillance camera holding a gun as he stalked and killed people inside Mumbai's main train station in November, police said. He's also accused of shooting people at Mumbai's Cama hospital. Kasab is one of 10 Pakistani nationals who police said unleashed terror on Mumbai, India's financial capital, for four days and three nights. Police said the gunmen killed more than 160 people as they took over three luxury hotels and a Jewish center, and shot up several other places, including a popular restaurant. The attack was an effort to capture Kashmir, prosecutors said. A dispute over whether India or Pakistan owns the territory has led to wars between the two countries.